Perfect cuts in steel, non-ferrous metals, wood and plastic. Even cuts glass and ceramics. The unit includes an adapter to connect a vacuum cleaner or dust extractor. Solid, ribbed die-cast aluminum housing (no tubular or sheet metal construction) with a sturdy machined table with slot for miter gauge. The table tilts up to 45° for accurate miter sawing. The machine has a low noise high-quality motor with belt driver for quiet and prolonged operation. Electronically controlled speeds allow for exceptionally accurate cutting without the need for subsequent finishing. 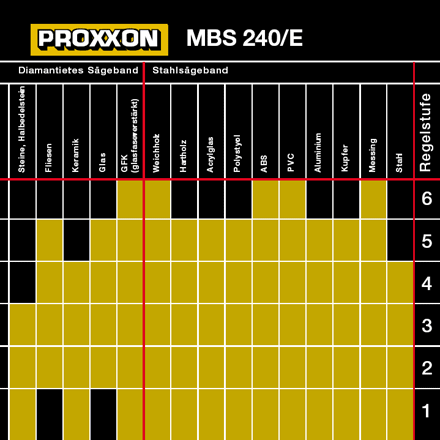 A chart indicates the recommended speed for practically all materials. The blade size of 13/64" x 1/64" (5.0 x 0.4mm) is ideal for fine work and permits cutting small radii. 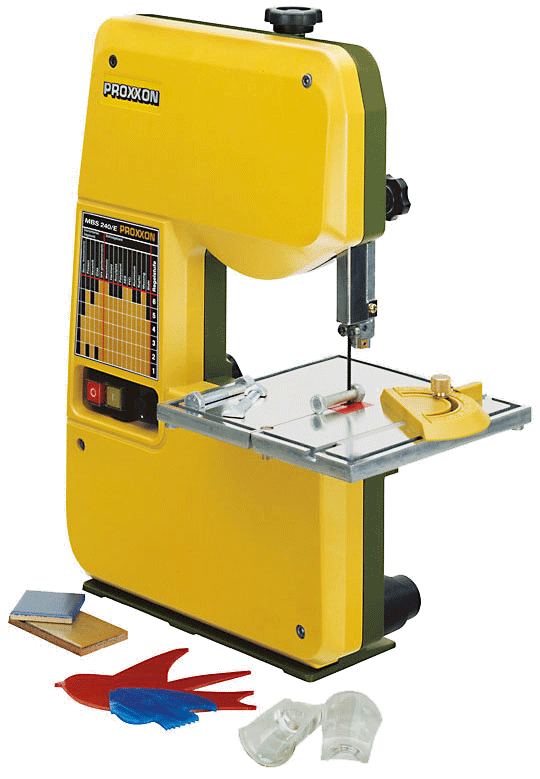 The machine comes equipped with one band saw blade in size 42" x 13/64" x 1/64" (1065 x 5.0 x 0.4mm), 14 TPI. These high-performance band saw blades are extremely efficient and are very unlikely to break, even when being used for prolonged periods. Each band saw blade is alternately set with teeth in N-form, which are individually sharpened. This type of toothing provides oscillation-free operation of the saw blade, which is extremely important in order to obtain straight and clean cuts. 42" x 13/64" x 1/64" (1,065 x 5.0 x 0.4mm). Of hardened Swedish steel. Ideal for cuts in steel and brass. 42" x 9/64" x 1/64" (1,065 x 3.5 x 0.4mm). Of special tempered steel, with induction hardened teeth. Ideal for cuts in aluminum and plastics. Extremely narrow, and thus optimal for cutting tightest curves and radii. 42" x 13/64" x 1/32" (1,065 x 6.0 x 0.6mm). 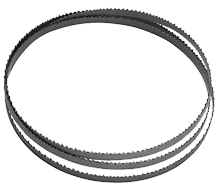 Carrier belt of alloyed tempering steel, sawing teeth of wear-resistant high-speed steel. Varying teeth 10 - 14 TPI. 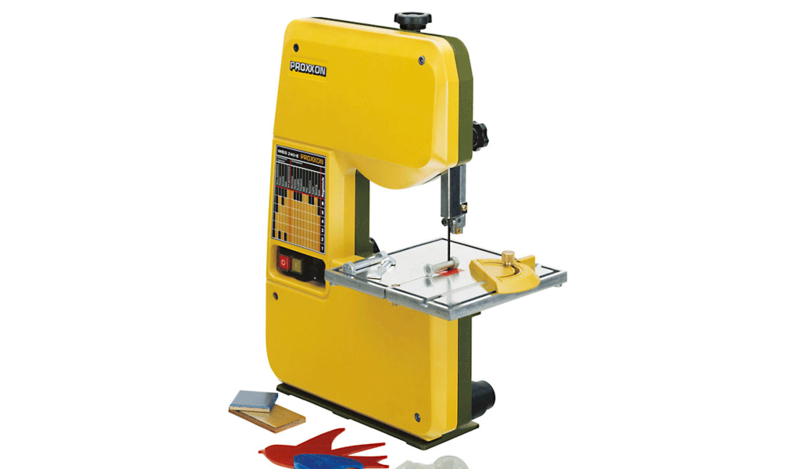 Ideal for cutting all standard steel qualities, non-ferrous metals and stainless steel. 42" x 7/64" x 1/64" (1,065 x 3.0 x 0.3mm). Ideal for cuts in glass, stone, ceramic PC cards. For cutting foam, plastic, rubber, leather, cardboard and paper board.